What's behind the banks approach to LVR policy? It is now 10 months since the Reserve Bank implemented its LVR policy, the macro-prudential tool designed to bring a cooling effect to what was clearly a heated property market, especially in Auckland. 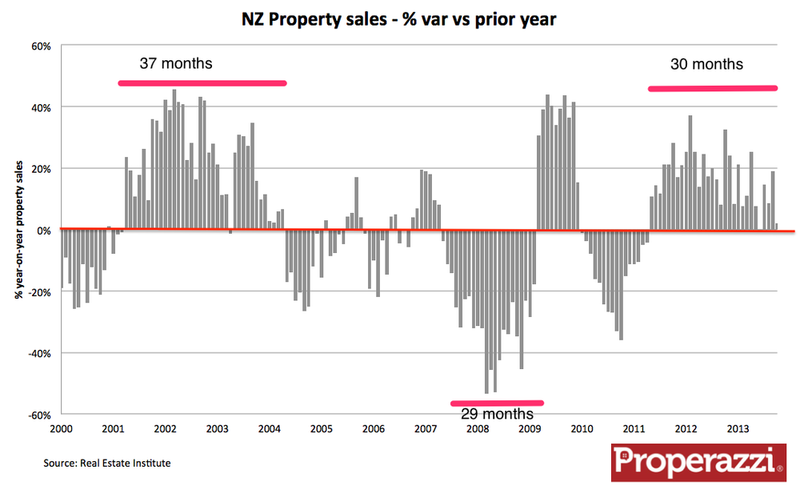 Ten months in which the property market has seen a significant turnaround. The market was already loosing momentum during the winter of 2013, having seen over two and a half years of volume growth when sales had risen on a moving annual total from 55,000 to 80,000. However the impact of the LVR policy by the Reserve Bank in October last year effectively stalled the engine of the property market. From a peak of 80,677 in October last year the annualised total of property sales has already fallen to 75,637 and year-on-year monthly growth has been negative since October plummeting to a 20% fall in April. Prior to the implementation of the LVR policy limiting lending above 80% loan-to-value to 10% of the total loan pool of the retail banks, this higher risk / low deposit sector was accounting for upwards of 25% of the total lending - at least that was what the data released by the Reserve Bank showed for the months of August and September of last year. Now I can fully believe that these months were somewhat inflated as those prospective buyers with low deposits rushed to take advantage before the door closed on these 90% and 95% mortgages. The make up of the customer base of these high loan-to-value loans is hard to accurately identify. Certainly there would be 1st home buyers, however there is no way that close to 1 in 4 of property buyers were at anytime 1st time buyers, more likely would be a number around 10%. The other customers of these high loan-to-value mortgages would be a mix of investors and speculators. Investors like to leverage their purchases allowing them to acquire a portfolio of properties whilst maintaining an available cash pool for future opportunities so they like 90+% loan-to-value mortgages - the low deposit multiplies the appreciation of the property in relation to their return on investment. Speculators also like high loan-to-value mortgages as it frees up cash for property renovations and improvements without having to constantly go back to the bank for progress requests for additional funding - speeding up their process of renovation and subsequent sale. There is no doubt these 3 segments of the property market were active in the the period of 2011/2012 as these 3 groups and particularly the latter two are generally good at reading the market and getting in quick before the market rises and then sticking or flicking (in the case of speculators) as the market ramps up. The subsequent months since October of last year have shown a significant slowing of the lending to these 3 segments. As the chart shows the subsequent months (with the exception of October) has seen the retail banks lend considerably less than their allowable quota of 10% of all loans (based on a 3 month moving average). Now here is the question. How complicated is it for the major retail banks to manage the lending to optimise this segment of the market whilst at the same time ensure that they do not breach the 10% threshold? You would think that given retail banks make profits from lending rather than hoarding they would be keen to continue to lend high loan-to-value mortgages to these customers based on the situation that if they did not, then some other bank might, after all they do operate in a highly competitive marketplace. Certainly the banks have advanced computer systems, modelling capability and staff to be able to manage that threshold day-by-day and hour-by-hour to ensure that they leant exactly 9.9% of their loan book each month. So why is it that over the course of the past 10 months instead of lending $3.9 billion of high loan-to-value mortgages they have only leant $2.7 billion? - they have in effect collectively denied themselves the opportunity of lending an extra $128 million per month for 10 months! Retail Banks despite their commercial imperative are conservative businesses and they mitigate risk. They also operate within a highly regulated industry. Their objective is to defray risk by ideally lending to low risk borrowers at higher rates than they pay to depositors on safe assets. Now property, especially residential property is generally regarded as a low risk asset. However the past decade has taught us all to regard nothing as low risk. Whilst the worst of the excesses of the sub-prime mortgage market was never close to our shores, the ripple effect was felt and has created a sense of caution in the banking industry. The Reserve Bank action in implementing its LVR policy effectively provided the retail banks with a legitimate escape card to which all of them could with one voice state that prospective customers should take more responsibility for the asset they wanted to buy by having a greater deposit than the traditional 10% or 5%. In one fell swoop the retail banks managed to avoid a great chunk of risk. Sure the impact was a collective loss of lending opportunity but given the favourable underlying economic conditions and the fact that the impact fell evenly across all banks there could be argued a view that the banks collectively were happy to shave a small amount off their earnings for a significant reduction in risk. This is merely a hypothesis but one that to me, has a degree of logic, I am not an economist but I feel there could be a part of the rationale at work within the retail banking industry over this issue. An alternative scenario is one that I have not heard voiced, so I’ll give it a go! There is actually insufficient demand to fulfil the supply side opportunity of high loan-to-value mortgages at the current 10% threshold. This logic relies heavily on a recursive argument that the impact of the announcement of the implementation of the LVR policy certainly can be seen as having a rush-for-the-door effect before the 1st October deadline and that mild panic matched to a clear media messages after the fact that banks were becoming highly restrictive of such high loan-to value mortgages would have had a dampening effect on demand. That dampened demand certainly lead to a slowing of sales, which was quickly reported in the media, which in turn lead to talk of the deflation of any property bubble, which whilst in principle a signal that should send a message of comfort to the market, actually caused a reaction from a core target market for these loans (being primarily investors and speculators) who believing that the market had peaked. They then judged that this was the time to exit the market, either through consolidating their portfolio or selling properties. This action suddenly and significantly depressed this segment of the market, possibly from a level of 15% - 20% of the market down to 5% of the market. Add to this behaviour another key issue of the Reserve Bank data as presented in the charts and numbers - the total value of mortgages each month as reported by the Reserve Bank is defined as ‘Total New Commitments’ - this sum $4,499 million in the case of June is the total value of all new written mortgages and includes refinance mortgages, especially including a significant component of moving from floating to fixed rate mortgages. The fact is over the past 10 months and especially the past 6 months with the clear signals of impending OCR increases the residential mortgage market has transitioned back to fixed term mortgages. This will have driven the total of 'new commitments' and therefore will have had a depressing factor on the percentage of high loan-to-value mortgages. So having presented the two scenarios I take the view that what we have seen in the market is probably a combination of both scenarios. Banks like to negate risk, it is highly probable that investors and speculators have moved to take a back-seat int he market and the re-mortgaging factor has also been at play. The only party therefore who have been a pawn in these moves has been true first home buyers who have been significantly effected by the LVR policy and also by rising interest rates. As to whether they are heading back into the market as witnessed and reported in the media, I doubt it and sadly there is no accurate data to back this up. Barfoot & Thompson published its Housing Market Update for May highlighting what is a clearly a slowing property market with the year on year sales volume down 14% as compared to May 2013. 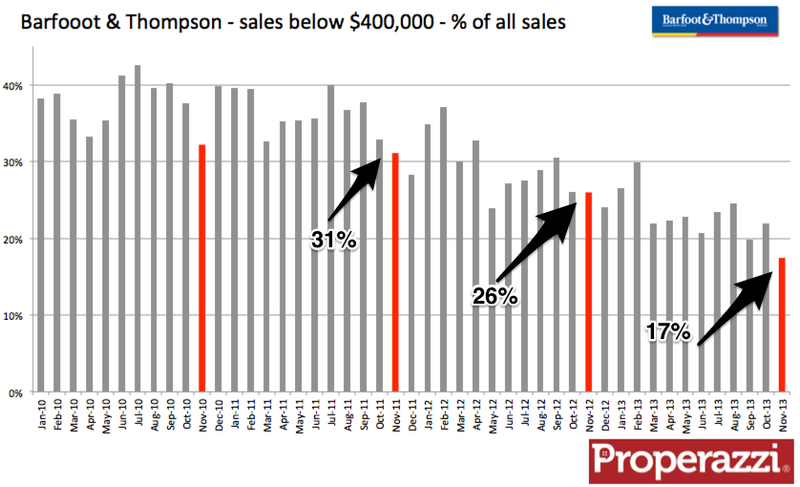 The trend of property sales is downward, from a peak in October last year the moving annual total of sales by Barfoot & Thompson in the Auckland market has fallen from 13,232 to 12,572 in May. Within the composition of sales for the month of May the most striking fact is that whilst total sales at 1,109 was down 14% compared to a year ago the sales of property below $400,000 was down 50% - the total sales in May 2013 of property below $400,000 was 301 properties, a year later this segment had fallen by half to just 151. 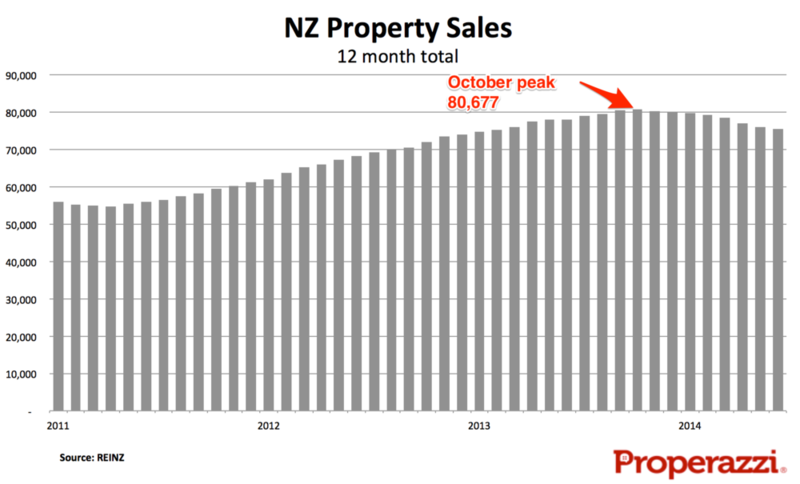 Just to reinforce these numbers, excluding the below $400,000 segment which still represents 1 in 8 properties in Auckland the remainder of the property sales, those over $400,000 saw sales volumes slip just 3% down from 991 in May 2013 to 958 a year later. So almost all of the 14% fall in total sales is as a result of the collapse of the sub $400,000 segment. It can be no coincidence that this segment of the market has been the hardest hit by the withdrawal of funding for high LVR mortgages which are primarily for 1st time buyers seeking an entry level property which in Auckland has traditionally been this sector. The LVR restrictions came into effect in October of last year and since that time sales in the 8 month period for property at this lower price bracket of less than $400,000 has totalled 1,541 property sales a year earlier it was 2,123, nearly 600 less purchases over that 8 month period, at a time when sales volumes overall barely changed. The chart below very clearly shows the impact of the LVR - performance before October certainly showed a weakening in the lower price segment of the market; however after implementation the impact has been striking with the red bars for the lower prices segments showing the decline in year on year sales volumes. The retardant of LVR restrictions has certainly quelled the fire of the property market which was burning brightly this time last year. The Reserve Bank has released actual data on the extent to which banks are lending at 'Loan to Value' levels of 80% and above - the threshold imposed by the Bank Governor in October last year. At the time the Governor stated that "From 1 October 2013, banks will be required to restrict new residential mortgage lending at LVRs of over 80 percent (deposit of less than 20 percent) to no more than 10 percent of the dollar value of their new residential mortgage lending". Well the fact is that based on the months of December and January retail banks are not only keeping such lending below the threshold of 10% - they are actually barely touching 5% of the loans (by value). In January just $147m of lending was made above the 80% LVR threshold representing just 4.8% of the total value of lending in the month. Accepting that January is a quieter month this amount represents a fall of almost almost 90% as compared to August last year. What is interesting is the extent to which this significantly reduction of lending above the 80% threshold equates to in terms of the number of first time buyers in the market. For this analysis I have made some assumptions as full details are not available. The data of weekly mortgage approvals published by The Reserve Bank shows the number and the total value and thereby the imputed average value. I have made the assumption that rather than thinking high LVR loans will be at a lower than average value, they are in fact more likely to be well above the average. The logic is that within this data set from the Reserve Bank of mortgage approvals is not just new loans but also refinancing of loans many of which may be older loans and thereby at a lower average value, whereas first home buyers representing a higher proportion of high LVR are likely to see loan values closer to say 80% of the median house price, thereby a loan of $330,000. For this reason I have assumed that high LVR loans have an average value of $275,00 whereas the average for all loans is closer to $175,000. This table below sets out the overall data of the average of mortgage approvals for the 22 weeks pre 1st October and the 22 weeks since 1st October. Based on the data and the assumption of high LVR loans, the data would seem to show that the massive reduction (close to 90%) in lending at high LVR represents a fall from around 1,100 such loans a week before the intervention of the Reserve Bank to an average of just 177 per week since the 1st October. Admittedly the last 2 months prior to implementation did likely see a degree of a 'lolly scramble" ahead of the changes. The impact of this tightening of lending controls in the housing market has consequentially lead to the overall lending market being down 14% in the number of mortgage advances and 20% down in value, with the traditional lower LVR loans hardly changing in volume or average value across this period. 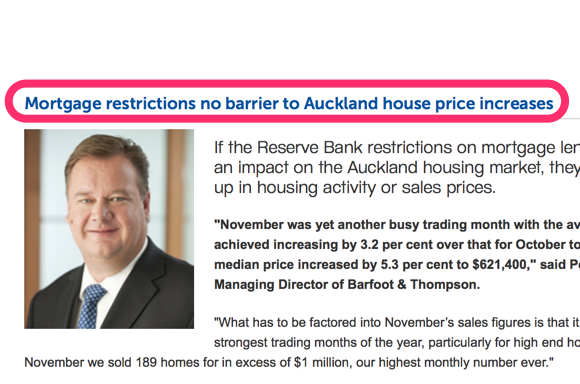 Clearly we only have 4 months data and the next few months will be most interesting to observe as to the trend, but at this point in time the data would seem to point to the view that the retail banks are being tighter in their implementation of the Reserve Bank's policy restriction than required - significantly impacting the property market.